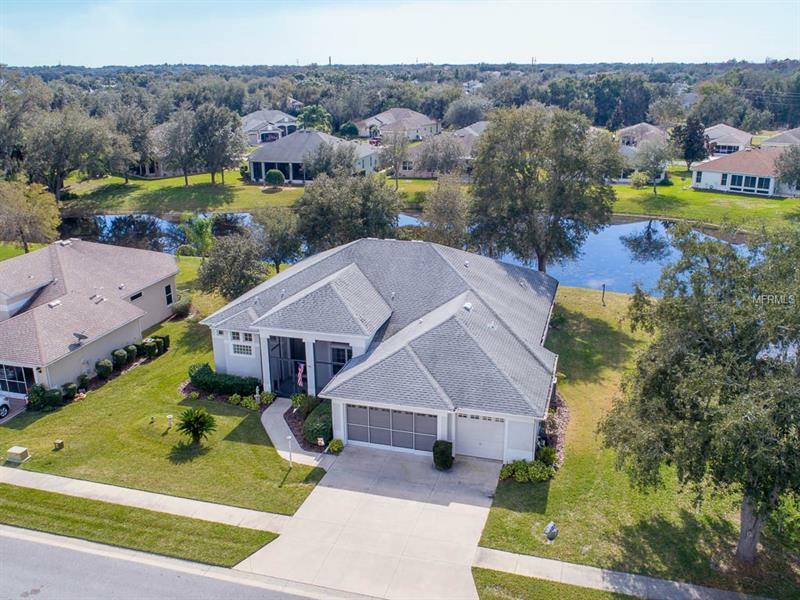 Beautifully situated on a pond view lot with dappled shade, you are going to love this location and home! Flagship Pringle-built Stirling model with all the right improvements! Appreciate the screened front porch as you enter via double doors and take in the over 11' ceiling Great Room with diagonally-set ceramic tiled floors, double-paned windows with highlights, and a spacious triple sliding door that pockets to reveal an expanded lanai, improved by the addition of tinted acrylic sliders to comfortably view the natural pond setting most always. Perfect for entertaining, it flows smoothly to the formal dining room and open kitchen with huge breakfast bar. Subtle and tasteful details prevail in this beautiful kitchen, featuring antique neutral raised panel cabinetry with crown moldings, corian counter with seamless double-bowl sinks and bisque appliances. This split plan design affords a very private sanctuary master suite, offering lanai access, two large walk-in closets and a well-designed master bath that features a custom, walk-in tiled shower and two extensive vanities. unique storage here too. Guests will appreciate the two spacious bedrooms and bath accessed via their private wing. All rooms here appreciate volume ceilings and designer fixtures. There's even a private den, highlighted by a french door to the abundant lanai. A true laundry room with a smartly-added powder room is just before entering the expanded full 3 car garage. Newer HVAC, copper plumbing and much more to see!